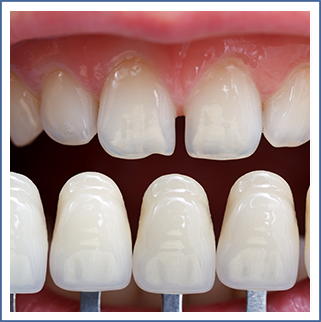 Dental veneers are ideal for teeth that are too small, too big or have uneven surfaces. It is very common for people to have imperfect teeth, either oddly shaped teeth, chipped teeth, crooked teeth, teeth with small holes in them or an inappropriate sized tooth or teeth that have an odd appearance. Dental veneers solve such irregularities and create a durable and pleasing smile. Dental veneers are thin, custom-made shells crafted of tooth-colored materials designed to cover the front side of teeth. First we take a model impression of your teeth and then we craft perfectly fitted veneers for a beautiful radiant smile. Feel free to contact us with any questions about dental veneers or to schedule a consultation with one of our cosmetic dentists.